Unexpected rains can quickly ruin sightseeing when on a once in a lifetime trip or even a hike. This underlines the importance of investing in a good quality travel umbrella to keep you dry. The best compact umbrellas for travel should be light, small, and durable. It should easily fit in your carry on or handbag without any inconvenience. Additional features that are useful for a compact umbrella are a flexible fiberglass that will be able to withstand strong winds. Also anything with a strong canopy fabric. You will also want a sizable canopy that will be able to protect you from rain and strong sun if needed. 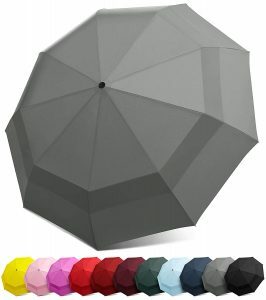 Finding a quality umbrella can be challenging given the number of options out there. We have looked at over a dozen umbrellas to save you the stress of doing it yourself. We have tested five noteworthy styles for the best compact umbrellas this year. Loved for its ability to withstand even the strongest winds, the Repel Windproof Travel Umbrella is a popular choice for extreme weather. Most travel umbrellas are made using six to eight ribs, the Repel umbrella goes further and encompasses eight ribs. The fiberglass-reinforced ribs paired with the umbrellas metal frame and shaft make the Repel one of the most resilient umbrellas you can ever have. The fiberglass material used to create the ribs is corrosion free and also adds some additional longevity to the umbrella. 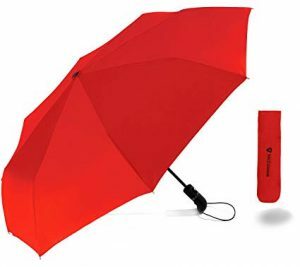 The Teflon coating on the fabric of the umbrella helps improve water resistance, and also allows the umbrella to dry quickly once you step inside. The Repel Windproof Travel Umbrella is very user-friendly. The automatic opening and closing mechanism allows you to operate the umbrella one-handed when your other hand is occupied with your luggage. The Repel compact umbrella has everything going for it including an ergonomic handle crafted from slip-proof rubber and a wrist strap to make sure it never slips from your grip. 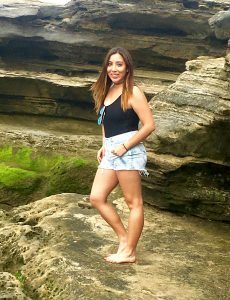 Additional features include its lightweight design coming at less than one pound and measuring 11.5 inches with all the quality materials used. Repel are geared to making sure that you don’t purchase any other umbrella. The company offers a lifetime replacement guarantee if it ever breaks so you only have to be careful not to lose it. 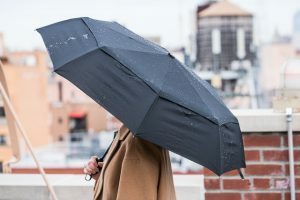 Many umbrellas are built for superior performance during rainy and windy conditions, but the Bodyguard Travel Umbrella takes things to the next level. The umbrella is built of 10 flexible long lasting ribs that prevent it from turning inside out even during the strongest gusts. The high-quality material trend is seen in other parts as well. 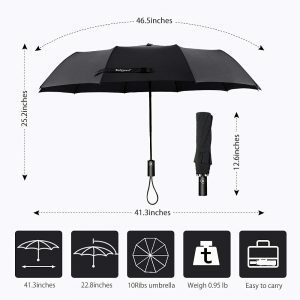 The umbrella has a wide 46″ high-density fabric canopy that is coated with Teflon which allows it to be water repellent with great coverage. Built to withstand harsh winds, the company made sure to make the open and close button equally resistant. Like the Repel Umbrella, the Bodyguard Travel Umbrella also has a rubberized handle that is ergonomic and offers a good grip. 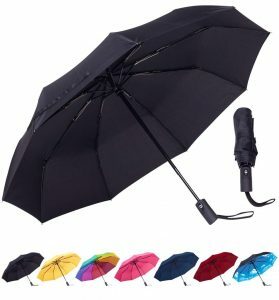 Compressing the umbrella reduces it into a neat 12.6 inch package that easily slips into the included waterproof leather sleeve. The company also offers a lifetime guarantee and will replace your umbrella- no questions asked, if at all it falls short of your expectations. The Rain Mate Compact Travel Umbrella has nine reinforced fiberglass ribs and an all-metal shaft. Feel free to walk out even on the gustiest days because this umbrella features a flip technology that ensures your canopy stays convex. Even when the umbrella manages to flip inside out, the canopy’s fiberglass hinges prevent the ribs from breaking. These features alone are ideal for many people as it makes the umbrella virtually indestructible, not to mention the lifetime guarantee that comes with it. The Rain-Mate Compact Travel Umbrella comes with an automatic close and open mechanism for quick handling and control. Collapsed, the umbrella folds in three stages to 12 inches, and you will also love that it comes with a storage sleeve so you can easily carry it in your purse or backpack. Though small, the 42″ canopy offers enough space for two and many of you color lovers will appreciate the wide variety of options available. 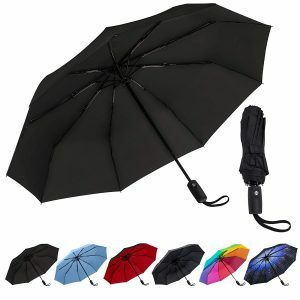 The Rain Mate Compact Travel Umbrella comes in black, pink and rainbow colors. The EEZ-Y Compact Travel Umbrella is a performer when it comes to rain protection. Its canopy is somewhat shallow compared to others but still gets the job done. The EEZ-Y umbrella offers a no-frills package that is easy to transport and comes in a sleeve that helps in keeping it neat and dry. The EEZ-Y company claims that the umbrellas double-canopy design ensures incredible resistance to gusts of up to 55 mph. The tempered metal shaft and nine reinforced ribs make the umbrella stronger than the competition and tough to invert. One big flaw of the umbrella is that the 9-rib design does not offer structural strength as the ribs did not coincide with ribs on the opposite side. The umbrella is very easy to use, however, thanks to the ergonomic handle and automatic mechanisms embedded. The canopy of the EEZ-Y umbrella is quite heavy and is somewhat difficult to close. You will need some additional muscle technique to open the umbrella despite having an open button. Overall, the EEZ-Y is a perfect umbrella for outdoor events and travel due to its weight. The McConnor Travel Umbrella is one of the lightest umbrellas but does not compromise on its strength or its durability. The umbrella is made using an 8-rib carbon and steel frame that can easily withstand the pressure from weather elements and time. The ultrafast single open and close button ensures that you can quickly get in or out of your car without getting wet. The one-handed operation makes the McConnor efficient and elegant. The slim and lightweight design means that the umbrella can easily fit in your purse or backpack. The umbrella also has an ergonomic rubber handle that is designed for a good non-slip grip, especially for those windy days. An elastic strap is also included on the handle to make sure this does not happen. When purchasing a travel umbrella, you will want to make sure that it can protect you from weather elements and is also durable. Here are some pointers on what to look for in a good compact umbrella. Umbrellas primary purpose is to protect you from rain, but other factors such as wind and sunlight might affect their performance as well. Here are a few elements you should pay particular attention to when buying one. One important factor to consider when sheltering from the rain is the size of the canopy, and a large-sized canopy will serve you best. Picking one from the store, however, is easier said than done. There is usually a trade off between the compactness and the size of a canopy. A more compact umbrella will not typically have a big canopy. While the benefits of a large canopy are easy to see, small canopy umbrellas are fine for light rainfall. These can also be great for kids due to their lightweight design. A deep and rounded shaped canopy will protect you better from the wind. Some unique designs like the double-canopy designs also perform well and are easily maneuverable in high winds. If winds are a major concern, some models have deep canopies that can be pulled down over your head and shoulders. An overhead canopy will not only protect you from the rain, but also protect you from the sun. A large canopy means you will get a larger shade. If you plan to use an umbrella for shade on a hike you will want to use a lightweight and compact style. Another factor to consider on sun protection is the color of the canopy. A black color canopy or one with dark patterns will absorb more heat and radiate it underneath the canopy. A clear canopy, on the other hand, offers no sunlight protection whatsoever. The strength of the shaft and stretchers play a big part in the performance as well as the longevity of an umbrella. Most products we have tested were made out of wood, acrylic, steel, or aluminum. While a compact sized umbrella offers its advantages, their durability suffers more than non-compact styles. A shaft made out of a single material will endure abuse more than a segmented shaft. Material such as steel and iron are just as durable as aluminum and fiberglass. Umbrella canopies come in a range of sizes and are made from a variety of materials. Most are made from nylon or some tightly woven fabric, but you will also find others that are crafted from PVC plastic. PVC is naturally waterproof, and nylon canopies will have some chemical treatment to make them water resistant as well. Such information is undisclosed on the product tags, as it is not very important. The canopy fabric will most likely survive all kinds of abuse, and the main features to research should the stretches and shaft. A compact, lightweight umbrella is useful because it won’t weigh you down during your adventures. Most travel umbrellas are just over one-pound, but there are some light builds that weigh close to half a pound. Most compact umbrellas measure about 12 inches in length and can easily fit in a purse, carry-on luggage or side pocket of a backpack. We recommend that you consider the compressed length and weight of a travel umbrella before making a purchase. 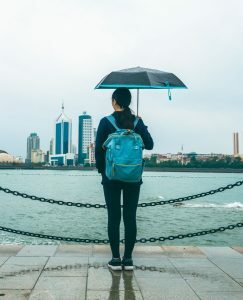 Whether you are traveling to a new city or are just preparing to go to the office, all these compact umbrellas are solid options. Compact travel umbrellas tend to have similar features, but the buyer’s guide above will ensure that you are able to distinguish the tiny differences that separate them. The umbrella you want to purchase will depend on your main travel needs. Just ensure that you take into consideration an umbrella’s portability, durability, and weather protection before picking one.